Japan is a land of refinement, and food is no exception. There are more Michelin starred restaurants in Tokyo than in any other city in the world. But of course, you can get sick of all those fancy and pretentious dishes – and this is where B-kyu gourmet comes in – simple, cheap food that tastes delicious. B-kyu means second grade – but the emphasis of B-kyu gourmet is on an A-grade taste, without the frills or the price tag that usually comes with it. It’s part of a bigger trend about getting back to basics – rejecting the elitist products that we’ve been led to believe are the best, and instead searching out the straightforward options that can easily slip below the radar. Japan now has enthusiasts passionate about almost everything B-kyu, from toys to sightseeing. 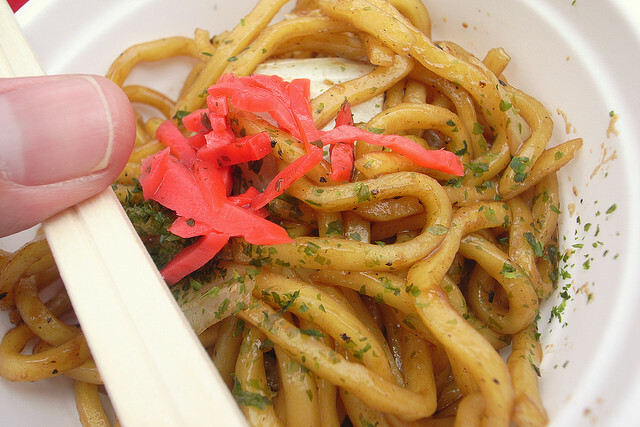 B-kyu foods have always existed – all around Japan there are countless tiny restaurants and food stalls selling noodles, rice bowls, okonomiyaki, tempura and the like. What’s new with the B-kyu trend is the zeal with which these basic foods are appreciated. There are now countless magazine articles, TV reports, blogs and even books dedicated to searching out the very best B-kyu cuisine. If a restaurant gets a good write-up, it can be mobbed for months to follow, with crowds of eager customers queuing out the door. B-kyu gourmet tourism is also a growing phenomenon, with more and more people travelling to out of the way towns just to sample a dish in its native setting. There’s a big emphasis on local ingredients, and discovering foods that previously weren’t known outside of a particular town or city. Many famous B-kyu recipes are well known Japanese dishes with a unique twist – like oden from Himeji that’s flavoured with ginger, or yakisoba from Okayama, paired with miso sauce and locally-grown cabbage. 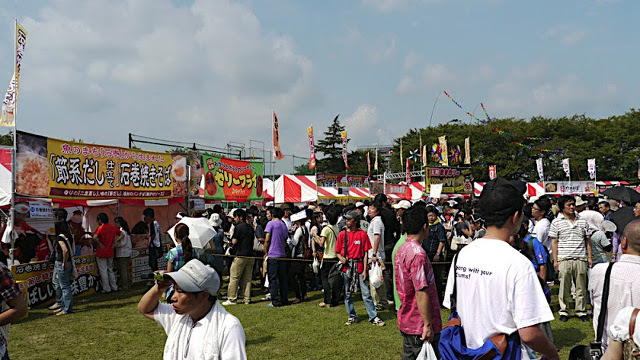 Perhaps the best way to experience B-kyu cooking is at one of the many B-kyu food festivals that are regularly held all over the country. Rows and rows of booths tempt your taste buds with a smorgasbord of mouth-watering options. Just the sight, sound and smell of all that food being cooked is about as close to foodie heaven as you’ll ever get here on planet Earth. 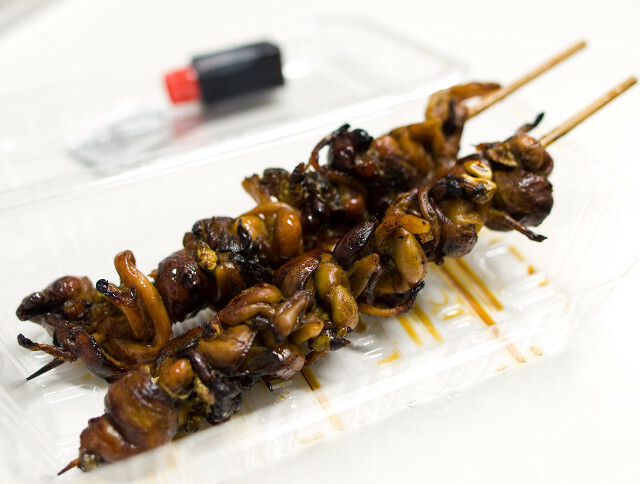 Crowds of hungry customers descend on the booths, sometimes queuing for hours just to get a taste of a particularly renowned dish – whether it’s a deer burger from Sayo, or chicken-giblet stew from Kofu. 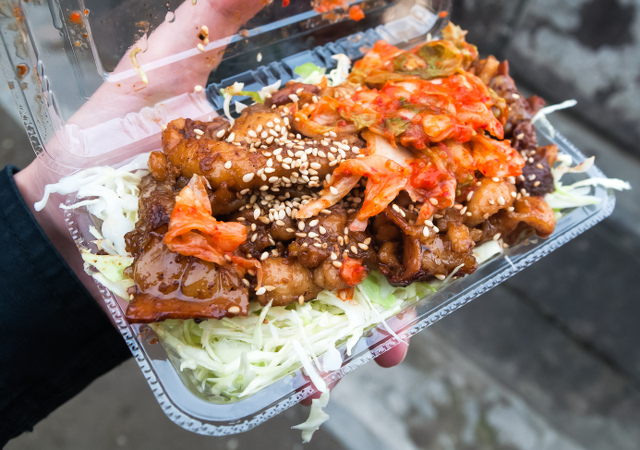 This is chicken skin and offal topped with Kimchi, all on a bed of shredded cabbage, which the photographer describes as a marriage made in heaven. If you want to try it yourself, you can buy it from a permanent food stand at the Tsurugaoka Hachimangu Shrine in Kamakura. Enjoy! The undisputed king of B-kyu gourmet festivals is the B-1 Grand Prix. It’s the final of a series of regional events held around the country, and moves to a different location every year. The entrants aren’t individual chefs or restaurants, but towns and cities, each of which sends a team to prepare a local speciality. The two-day event is regularly attended by over 500,000 people, and it’s totally democratic – festival-goers vote for their favourite entry by depositing their chopsticks in the appropriate tin after they have eaten. A win can be a major boost to a town’s economy, as not only will food-loving pilgrims descend from all over the country, there’s also a spike in demand for the local produce used in the winning recipe. In recent years the B-1 Grand Prix has been extended to include local crafts and performances – but food remains the backbone of the event. It’s held in early autumn, but check the official website here for the exact time and place of the next event. If you can’t make it to a Grand Prix in person, look out for the winning entries in convenience stores and restaurants in the months afterwards – they’re widely replicated, often using authentic ingredients sourced from around the winning town.